Ever since doing research on how to set up an index portfolio for Americans, the case for index investing in my mind just keeps getting bigger. It really is the simplest and one of the most effective ways to invest. It’s geared for a wide spectrum of investors ranging from the beginner who has no knowledge of the stock market to the most advanced investor who watches the market every minute of the day. What I really like about index investing is the set it and forget it mentality. There is more focus on saving money to make a new contribution into the investment account than fidgeting with the investments themselves. When it’s up to an investor to decide on when to buy and especially when to sell, they will most likely trail the market. For most of us, a much more efficient and prosperous strategy is to buy the broad global market for the long term as cheaply as possible (with proper asset allocation – ie. bonds increasing as you age), keep rebalancing to your asset allocation with new money annually (or more often), then forgetting about it until retirement. Getting off the soapbox, let’s assume that you are ready to jump aboard the indexing train with a ticket in hand. What’s next? 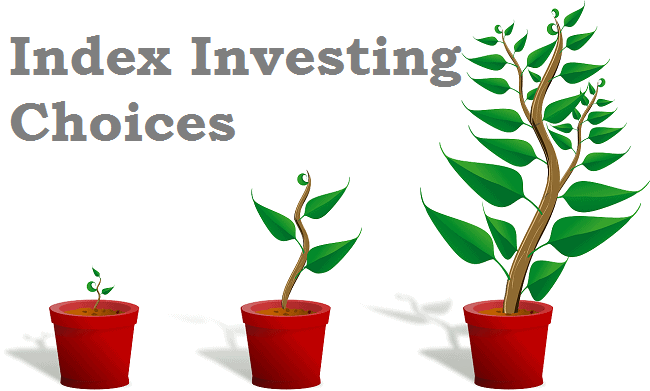 There are a number of indexing solutions in Canada. They range from do-it-yourself with ETFs to Robo-advisors to even using your bank index mutual funds. If you’re brand new to investing and not sure about ETFs, then this may not be the best option. However, if you are interested in DIY investing, this will likely be the lowest cost option and keeping costs low will make a big difference over the long term. DIY index investing involves opening up a discount brokerage and buying and selling index ETFs which trade like stocks. To keep costs to an absolute minimum, the ideal scenario is to use a discount brokerage that waives the trading free on ETFs. As you can see, the portfolio MER would be pretty low averaging between 0.14 to 0.30% depending on your weightings and the amount of XAW you are holding in your RRSP (withholding taxes). If you want more portfolio ideas, you can see more low-cost ETF portfolios here. If you are from the U.S, here is my index investing suggestion. Asset allocation is another element that you’ll need to think about – in other words, the percentage of bonds and equities in your portfolio. Essentially, you’ll want to increase your bond allocation as you get closer to retirement. Bonds will reduce the big swings in portfolio value from year to year (volatility), but will slightly reduce your portfolio return over the long term. Here is a detailed article on the basics of asset allocation. After you’ve set-up your portfolio, you’ll need to periodically adjust your holdings so that it maintains your asset allocation – this is called rebalancing your portfolio. So if you want to have 25% in each of Canada/US/International/Bonds, at the end of the year, the ratio will likely be a bit off. For me, I like to rebalance when I add new money to the account. To make it even more simple with ETFs, Vanguard/iShares/BMO have introduced all-in-one ETFs that will eliminate the need to rebalance your portfolio. In a single ETF with a relatively low MER, you can have a globally diversified indexed portfolio. You simply need to pick the ETF that suits risk tolerance (bond %). More details on all-in-one ETFs here. If you aren’t so confident with buying and selling ETFs and more comfortable with mutual funds, then TD E-series offers the lowest cost index mutual funds out there. They also have no trading cost to buy or to sell so it’s ideal for a smaller portfolio. I use these mutual funds exclusively for my children’s education fund. However, at the time, discount brokerages didn’t offer commission-free trading with ETFs. If I were starting over today, I would have likely gone the ETF route. Assuming that you have a 25% weighting for each fund would result in a portfolio MER of 0.42%. The only thing is that you can only access these funds through a TD Mutual Funds account that you need to open in a branch. Here was my experience on opening a TD e-series accouint. Like the DIY option above, this portfolio will need to be manually rebalanced on a regular basis. We rebalance on an annual basis when we make the RESP contribution ($5k between two kids), then again when the government provides match funding ($1k). The option of using a Robo-advisor is gaining traction for investors that want to be totally hands off. Essentially, the Robo-advisor will determine your risk tolerance via questionnaire and set your index bond/equity allocation accordingly. While a DIY portfolio may cost you between 0.14-0.3%/year in fees, expect a Robo-advisor to add at least another 0.4% onto that. A big benefit of the Robo-advisor is that it will automatically rebalance for you on a regular basis and some will even give you financial planning advice. Here is a full comparison of Robo-advisors from the Globe. Tangerine Balanced Portfolio: 60% equities (20% Canada; 20% US; 20% International) and 40% Canadian bonds. Tangerine Balanced Growth Portfolio: 75% equities (25% Canada; 25% US; 25% Internationaal) and 25% Canadian bonds. As with any balanced fund, there is no need to manually rebalance as the fund will take care of that for you. I like the simplicity of this solution, although it costs a little more than a low-cost Robo-advisor. If you are dead set on staying with your bank, then the best way to index is through their in-house index funds. They all have them despite what your mutual fund representative may recommend. Similar to the way that I have our RESP set up with TD, you can do the same with any of the big banks. What’s the catch? You may end up paying a bit more (should be close to 1%), and you may need to have meetings with your advisor when it comes time to rebalance. I have each of the big banks and their index offerings broken out here. Many of you work for an employer that offers RRSP matching with a selection of available funds. The selection can be overwhelming, but the secret is to build a portfolio similar to what I did for our education fund with TD (explained above) but choosing funds with the word “index” in the title. You can choose similar “index” funds from US, International and Bonds to keep your fees low and performance higher than other more expensive actively managed funds. For the nitty-gritty details, you can read my post on choosing mutual funds from your employer pension. There are many ways to index your portfolio, but the above are my thoughts on the best options available. DIY with index ETFs is likely the best option for ultra-low-cost investing, but also requires the investor to open a discount brokerage account and buy/sell ETF positions when rebalancing (except when going with an all-in-one ETF). If you are the type of investor who wants convenience over all else, then I would recommend an all-in-one ETF, Tangerine or a Robo-advisor. Those solutions work just fine with an automatic payment into the fund/account and the occasional review of your account. For specific calculations for your particular situation, Moneysense created a nifty spreadsheet that will help you with rebalancing your portfolio. Wow those MERs are quite high in your DCPP! Did anyone ever ask the company to change the fund offerings? I did ask my company. No way! They don’t even understand why I’m asking. They don’t have an incentive either I believe. Most employees don’t understand any of this either and so the only way to free my money would be to quit so I can just move the money to my broker. My company plan has some of those same mutual funds but the MERs are substantially higher. The Canadian index fund in my plan has an MER of 1.3% and the rest are even worse. Manulife is taking unfair advantage of me. Wow good post aNd thanks for the heads up of what etfs you recommend. Personally I like doing it myself but see the potential of the robo advisors. Great read. It’s amazing the advancements we are making. I remember when discount brokers like Questrade were new kids on the block and I didn’t think it could get any better with those commission prices. Now we have ETFs saving people from over priced MERs and Robo Advisors making the decisions for you with a simple questionare. What a great time to be alive! Hi MIchael, yes we have a number of Vanguard options in Canada. For US exposure, VTI (in USD) is popular and super cheap. Great information thank you. I have decided on a robo legacy account for my kids and Gkids within the next few months. Has anyone done a return comparison between the ETFs of Wealthsimple and Nest Wealth over the last couple of years? Any other information on these would be welcome besides just their costs.